Splines support now cusps, that is left and right asymmetrical tangents to a control point. A new image item object exists. This allows you to paste a preferably small image and move it around like it were a box, resizing it at will. This is quite useful to be able to manually overlay lines and trace images. Since the image is directly encoded in the file and not saved as a separate image it is not very efficient and using large images is not advisable. In the future a new bundle file format needs to be implemented. 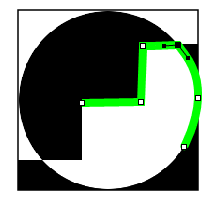 The screenshot shows an example of tracing the GNUstep logo imported as a bitmap, using the cusp point in the upper right. To support cusps, the file format changed again, reading of old formats is still supported.